Happy Sweet Sixteen Heaven’s Gate Cult! …Why is Your Website Still Up? MARCH 1997- Time really flies when you’re chasing comets. Nothing ages you faster than realizing something that felt like yesterday has hit one of those milestone anniversaries. 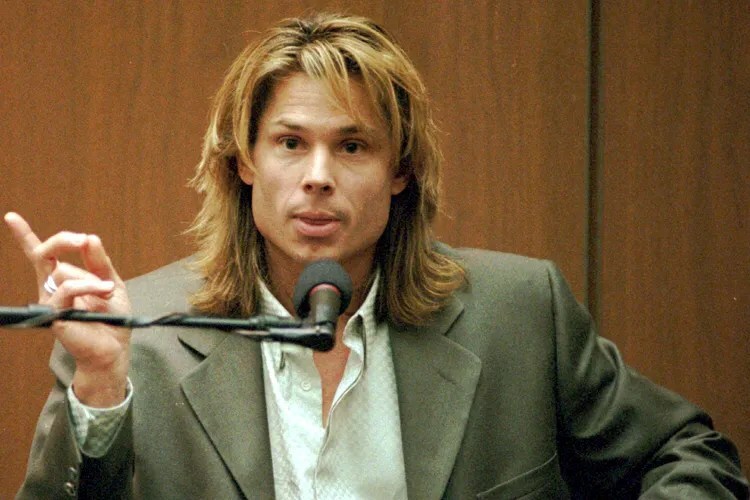 Over sixteen years ago, while I was arriving home from school, watching VHS-taped episodes of MTV’s 120 Minutes with Matt Pinfield raspilly touting The Prodigy’s “Firestarter” video, out on the West Coast, Nike was unknowingly about to get the most bizarre and macabre free advertising in history. 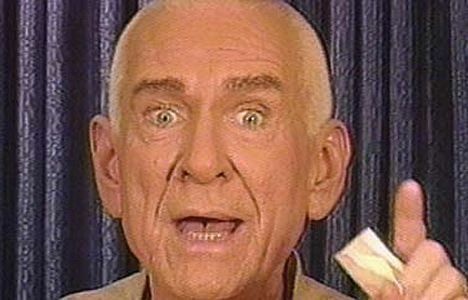 “Heaven’s Gate”, a religious cult based out of San Diego, founded by lead nutball and perpetually bug-eyed loon Marshall Applewhite, believed that the Earth was about to be “recycled”. Now, according to me, this “recycling” means that I’d have to drag the Earth out in a beat-up blue can to the curb on Friday morning to be thrown into a giant truck, but apparently Applewhite thinks bigger than I do. As far as he was concerned, this giant rock was about to hit its expiration date, and it was time to blast off onto the next plateau. Of course, any other day, the planet being recycled would some pretty sour news for the human race, but rest assured, when life closes a door, it sure opens a window. 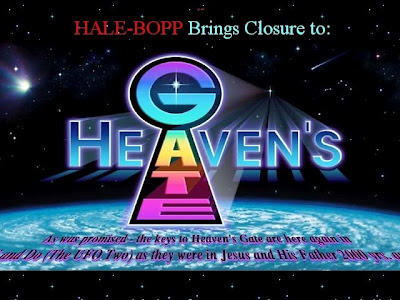 Opportunity oddly knocks at the strangest times, and luckily enough, this “recycling” coincidentally presented itself when a comet by the name of “Hale-Bopp” was about to voyage past Planet Earth. Though in the world of Marshall Applewhite, coincidences simply don’t exist. He just used common sense… and common sense always tells us where there’s a comet passing by, there’s a freakin’ alien spacecraft following it. 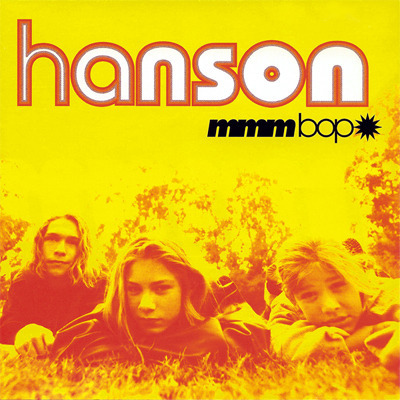 It’s likely Applewhite confused Hale-Bopp with Hanson’s then-fresh single, “Mmm Bop”. Still, mass suicide seems a little hasty. Probably. So, when the rare opportunity to jump on an alien ship comes around, you sure as soup don’t sit around, letting moss grow on your back. You spend your life savings on alien abduction insurance, spend a sunny weekend castrating yourselves, purchase a crapload of black Nike sneakers, and whet your appetite for some mouth-watering poison as your main course. Sadly, on March 26, 1997, the 39 members of Heaven’s Gate were all found dead in their large San Diego estate, all victims of a mass suicide; an act performed for their souls leave their “vehicle bodies”, evacuating the Earth and getting a one-way ticket on board that UFO. Even Amanda Bynes thinks this is nutty. In three shifts, the cult ingested a deadly mixture of apple sauce mixed with sedatives and vodka. Which doesn’t seem too logical– if you’re gonna go, why not sprinkle some poison on freshly seared t-bone steaks instead? Go out big time! Go tasty! 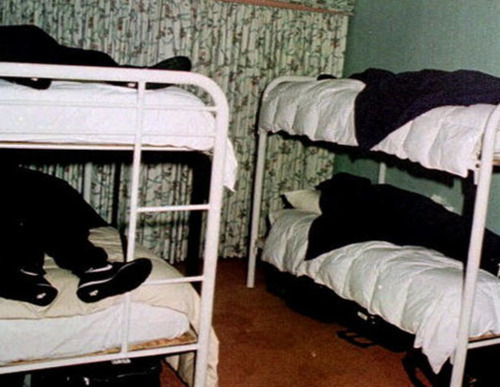 They were all found neatly in their beds, dressed identically in all black sweatsuits and Nike sneakers with purple cloths covering their heads. They also each had $5.75 in their pocket for their travel. Talk about being cheap Applewhite! The George Washington Bridge just to get from New Jersey to Manhattan is now $13, so even with inflation adjustments, they really underestimated the price of a spaceship to Heaven. This is not what Nike meant by “Just Do It” . Tragic as this was, it was just another sad example of a confused and lost group of souls latching on to a Fruit Loop who preached a bunch of mumbo jumbo their way, ultimately leading to their untimely demise. – In 1978, the People’s Temple Agricultural Project led by Jim “I really look like I’m in 1978″ Jones, poisoned a vat of fruit punch and intimidated over 900 tentative followers (and their children) to commit “revolutionary suicide” in Guyana. – In 1994, 74 members of the Order of the Solar Temple took the same route in Switzerland. 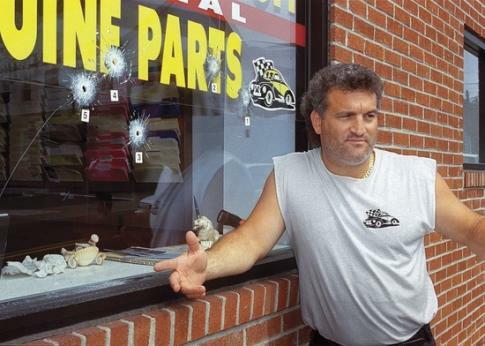 – …and of course, we can’t forget the 1993 ATF siege on the Waco, TX “Branch Davidian” compound following a 50-day standoff, which led to the deaths of 74 people including their leader, “The Wacko in Waco”, David Koresh. All led by the screwiest of screwballs, but Heaven’s Gate, while having the same sad, eventual conclusion, had one major difference to set it apart: Unlike all of those cults, Heaven’s Gate differed due to its presence on the still wet-behind-the-ears World Wide Web. Heaven’s Gate and their ripoff Green Bay Packers logo ran a webpage that just screams out “1997” so badly, I’m shocked it doesn’t have Chumbawamba playing in the background. This thing was one slippery step away from a thrown-together perpetually “under-construction” Geocities page. Talk about gaudy too… their site looks like Richard Simmons vomited a candy necklace and a milk crate of pinwheels all over your computer’s monitor. Now, I’m not Matlock or anything, but the obvious question here is– How does a cult whose entire crew took a simultaneous swan dive still have a running webpage over sixteen years later? The world of the internet has changed immensely in that time, yet this relic keeps on truckin’. 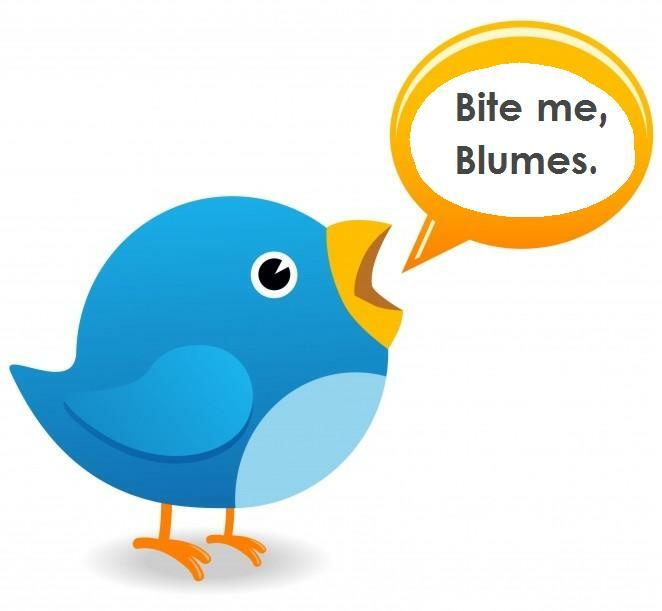 Why do I get errors on Twitter half the time I go on there, and these shaved-head Star Trekkers have a site that is still up-and-running seemingly error-free? Nothing screams out “WARNING! WATCH FOR YOUR LIVES!” like Comic Sans. 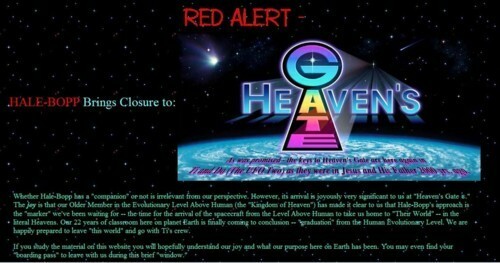 Above is one of the true gem pages of the Heaven’s Gate website. This is captioned “How a Member of the Kingdom of Heaven might appear”. Apparently they figure Jesus spends his day hanging out with extras from the movie Fire in the Sky. 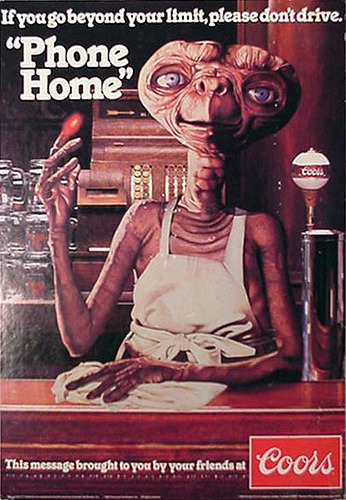 It’s painful to believe 38 people listened to a man who ran a site with a cheesy 1970’s alien on it, and I can’t get one person to listen to my idea of cough syrup that tastes like Buffalo sauce. This is a note to the media assumed to be read following the discovery of their earthly bodies, explaining the circumstance of events and reasons for their “graduation” from Earth. It also gives a “how to” of sorts if one wishes to join the three-ring circus in the stars. 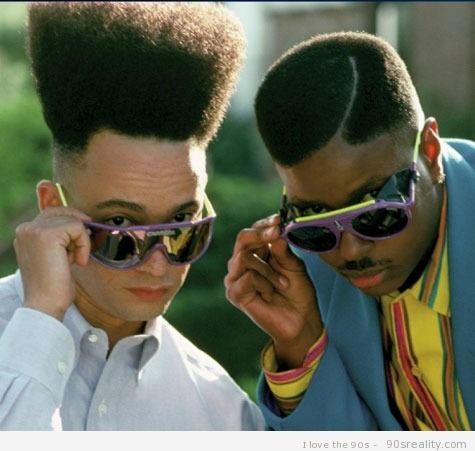 Now, call me crazy, but if they figured the world was going kaput, why plan to keep your site running afterwards? Especially for the better part of two decades! Who’s still signing those checks for the domain name? Doesn’t seem like the top on the list of priorities an apocalyptic world needs. Don’t believe all this malarkey they’re preaching? Think it’s a bunch of hooey? Aliens, comets and all that jazz? Sounds like Heaven’s Gate wasn’t playing with a full deck, right? Well, Old Man Applewhite’s about to drop some freaky knowledge on your sorry tuckus. 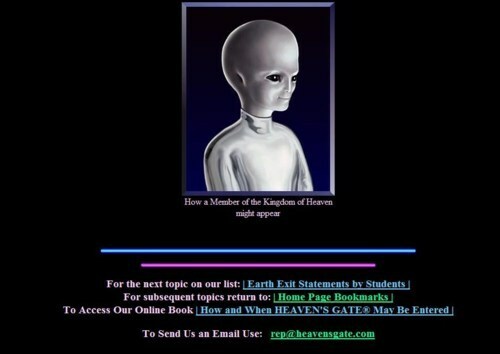 Here’s a 1995 statement from an actual extra terrestrial in a HUMAN BODY. Not a human, but an alien in a human body… like Halloween on Mars. We should all start eating some tasty crow, cause that’s concrete proof staring you right in the face. So, over a decade-and-a-half later, we look back at a tragic loss of life, and a tragic waste of apple sauce. Cults will always be a strange and frightening phenomenon, hard to understand, sadly with a trainwreckish-aspect that seems to follow. We can only hope to learn from this tragedy and try our best to prevent something like this from ever happening again. It just leaves us with a question of why? Why would people follow a madman to their doom? We may just never know how lost people can feel when pushed to the brink of desperation. You can call the members of Heaven’s Gate lost, misguided, or just plain insane, but they never had to live through Speed 2, Papa Roach or My Wife and Kids. Unless the spaceship had cable- then that’d be the real tragedy here.